Home › Uncategorized › 5-Hour Energy Minimally Distinctive or Purely Descriptive? 5-Hour Energy Minimally Distinctive or Purely Descriptive? Trademarks are required to be distinctive and to serve not as a description of the goods or service, but as an indication of the source of the goods or services. Innovation Ventures LLC filed Israel Trademark Application Number 223922 “5-Hour Energy” for energy drinks, including concentrated shots of energy drinks in class 32. The application was filed in September 2009 and refused in July 2010 as lacking distinctiveness as required by Section 8a of the Israel Trademark Ordinance – 1972, and under section (10) 11 of the Ordinance as being descriptive and directly related to the type or quality of the goods to be marked therewith. Furthermore, the Trademark Department of the Israel Patent Authority informed the Applicant of 5 similar co-pending applications: 221,579 “5 Hour Energy”, 221,718 “4 Hour Energy”, 221,719 “6 hour Energy”, 232512 “5 Hour power” and 232,515 “5 HOUR PAOWER” to other applicants, creating a situation of competing applications. The Applicant persuaded the applicants of the competing marks to withdraw their applications, and requested that if not considered inherently distinctive under Section 8, would be considered for registration under Section 16a, which allows registration for marks registered in the country of origin under certain conditions. The Examiner stuck his ground, dismissing evidence alleging that the mark had acquired distinctiveness in Israel through use, and further rejected the application to register the mark on the basis of the mark registered in the country of origin. The Applicant tried to prove the acquired distinctiveness with an affidavit from one of the managers, a Mr Robert MrCormack. However, at a hearing on 18 December 2012, Mr McCormack did not show up and so could not be cross-examined. It transpires that the Hearing Officer of a corresponding application in the UK (No. 2607023) found the mark inherently distinctive. The applicant also posited that the mark was, at best, a hint of its properties, basing itself on arguments filed in the US, where it noted that the term could relate to food, drink, injections, pill, exercise, electrical energy or nuclear energy, and was therefore, at best suggestive and not descriptive. The applicant noted that it had spent about $100 Million on advertisements and product placement in the US, and that several offers made to manufacturer to import and distribute the product in Israel were indicative that the mark was well-known here, even though the product wasn’t actually available in Israel. Applicant also noted that the US product had received Kashrut approval and was, therefore, known in the Jewish community in the US, which has connections with a large section of the Israeli public. In the ruling (unsigned), the adjudicator noted that the absence of Mr McCormack minimized the value of his testimony, including the worth of surveys, since it was impossible to ascertain how they were performed and how reliable they were. The Adjudicator went on to rule that the mark lacked sufficient inherent distinctiveness and was too descriptive to be registered under Section 8, but could be registered under Section 16 since it was difficult to argue that it had absolutely no acquired distinctiveness. I am unhappy with this decision. The label including colors and graphic elements may be distinctive. If disclaimers were still being registered, I have no doubt that the words, 5, hour and energy would all have to be disclaimed. 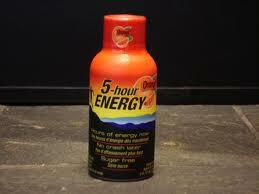 I think a term such as 5 hour energy should remain available for all providers of drinks, shots, pills, injections, etc. that provide a 5 hour energy boost. To prevent confusion, specific suppliers should choose specific and distinctive product names. TRIPS notwithstanding, registering a mark like this merely because it was registered abroad seems like a perpetuation of a poor decision. “What is it about energy drinks that causes a difference in opinion between the learned adjudicators and this blogger…?” I can only assume that the learned adjudicators have actually tasted this muck and therefore have it in for the manufacturer.